With the familiar chill of early fall comes jack-o’-lanterns on front porches and paper cutouts of bats, black cats, and witches on broomsticks in the windows of homes and school buildings. 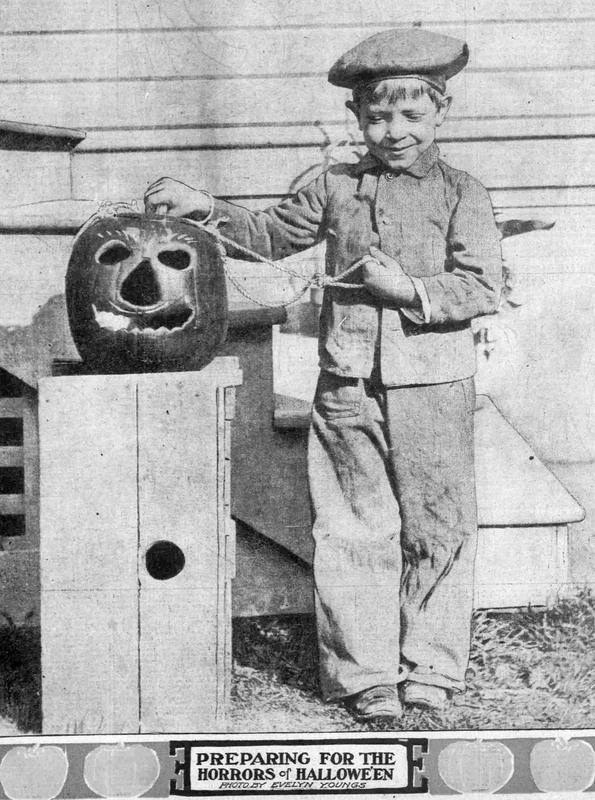 Halloween is here once more, and the fun and oftentimes spooky traditions of the holiday as celebrated in the state of Oregon have been well documented in Historic Oregon Newspapers. A horseshoe is hung in a doorway, and each set of partners is given three lady-apples. Each, in turn, tries to throw the apples, one at a time, through the shoe. The one who succeeds wins the prize. Or, if you do not want to give prizes, she will be pleased to be told that she will marry young. Hang a ring from the gas fixture and ask your guests to try to run a pencil through the ring while walking toward it. The winner will be the next to get married. Nearly all Halloween games have to do with love and marriage. 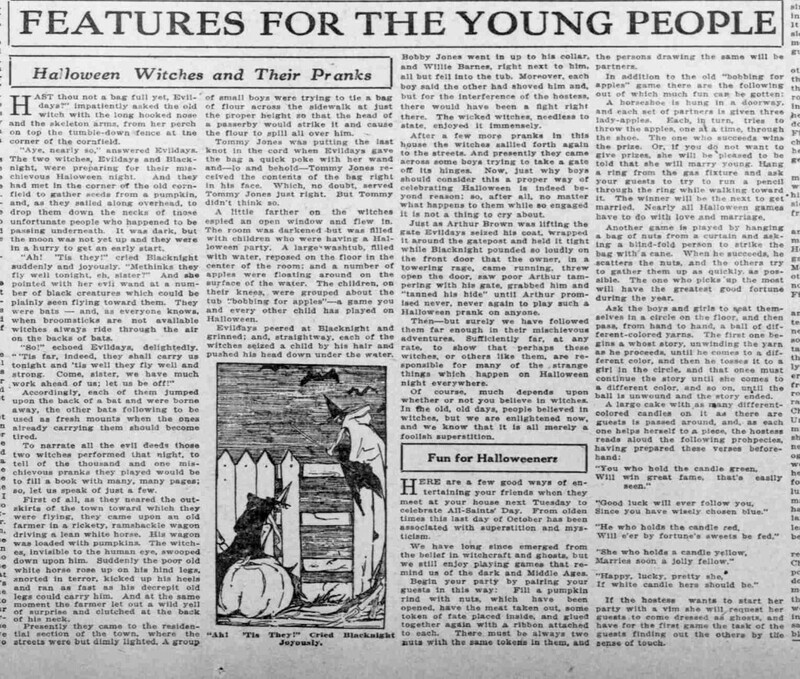 The Morning Enterprise, in the October 23, 1912, article “For the Children,” suggested parents have their children play the “lucky candle game” for Halloween: “For this game provide a large tub of water and small candles for those who wish to try their luck. The candles are mounted on bits of wood by means of a pin or thin nail driven through it. Each player then launches his little boat, and the candles are all lighted as quickly as possible. The owner of the candle that burns the longest will be the luckiest guest of the party. The good luck is supposed to remain with the fortunate winner for the ensuing year.” Hopefully, Oregon City parents who heeded the Morning Enterprise article had more than a few fortunate winners at their children’s Halloween parties. 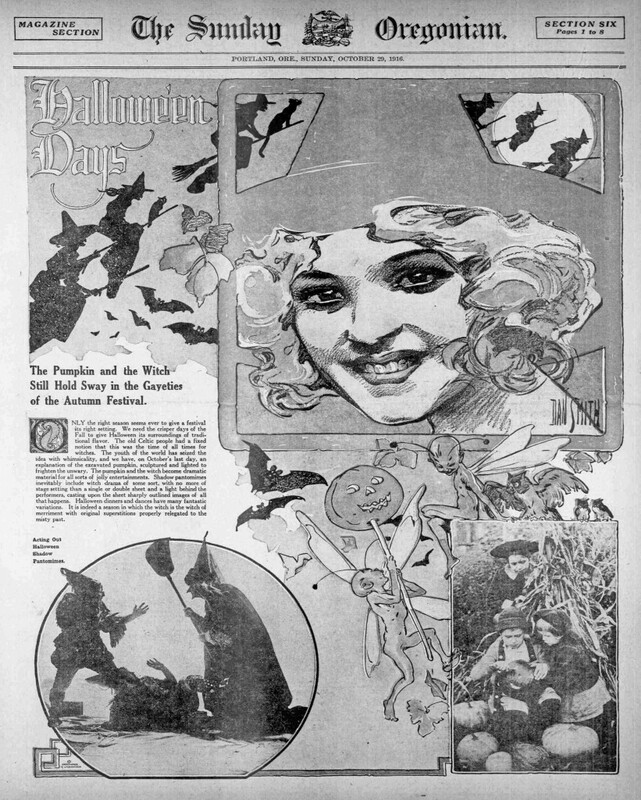 As the sun sets October 31 and costumed revelers, young and old, fill streets and homes with Halloween cheer, take a page from Historic Oregon Newspapers and their coverage of spooky fun and frolic in decades past. Make sure party spots are “most attractively and appropriately decorated in the striking Halloween colors.” Serve refreshments “around an artistic orange and black table.” Play games “out of which much fun can be gotten.” And Happy Halloween! ‹ Milestone! 10 Million Pages on Chronicling America!